Scales from 60° to 90°. For higher see Field of view (FOV). 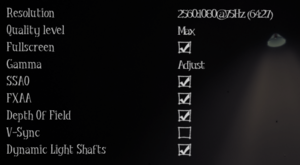 Go to the in-game control options. 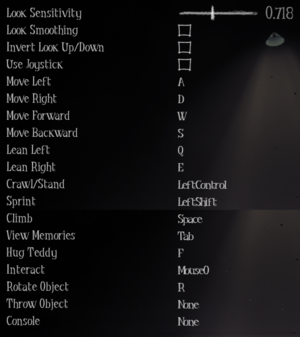 Disable the Use Joystick option. Scroll to the bottom and bind a key to Console. With the console open, type in fov X where X is the desired FOV value. 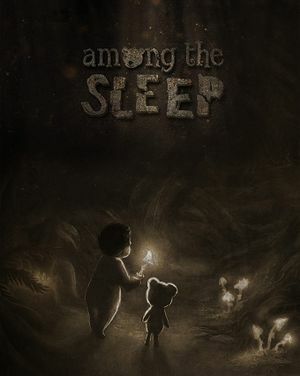 Use Helix Mod: Among The Sleep. DK1 support, no DK2 or CV1 support LibOVRWrapper might work for this game. Use Tobii Game Hub Supports head tracking. This page was last edited on 6 April 2019, at 04:16.